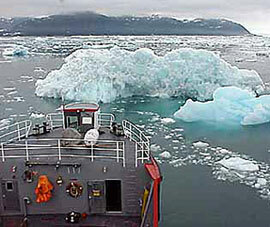 This is the online version of a job aid designed for volunteers who report aerial, shipboard, or shoreline observations of ice conditions at sea to authorities such as the National Weather Service, National Ice Center, U.S. Coast Guard, pilots associations, port authorities, or other maritime interests. In the job aid, emphasis is on conditions of concern to mariners with regard to safe passage of ships. Order a Copy: You can ask to have a free copy of the print job aid mailed to you by contacting our Photos and Orders Specialist by email or by phone (206.526.6558) (One copy per request, please). Below Zero: The art of icebreaking: An article from the Coast Guard Compass (official blog of the U.S. Coast Guard) explaining how the Coast Guard Cutter Polar Star, coupled with skill and appropriate tactics of a knowledgeable ice pilot, will have channels ready and prepared for the arrival of commercial vessels and help them with safe transit through the ice. Marine Ice Atlas for Cook Inlet, Alaska [PDF]: A compilation of previously published and unpublished information on the climatic, meteorological, oceanographic, and hydrodynamic conditions that influence the marine ice cover in Cook Inlet. Published by the U.S. Army Cold Regions Research and Engineering Laboratory (CRREL). Job Aids for Spill Response: Learn more about the job aids that OR&R has created to help oil spill responders complete their response tasks.